I’ve used poussins here, baby chickens which will cook in about three-quarters of an hour, though you can spatchcock a regular chicken the same way. One poussin will serve two people, or one person if you’re as greedy as me. Either way, everyone gets a bit of breast, leg and wing, and it’s pretty much obligatory to tear them apart with your fingers and gnaw all the sticky, savoury bits off the bones. This is not for dainty eaters who don’t like getting messy or anyone who doesn’t like chilli. But (adult content warning) it’s hot, juicy and finger-licking good. 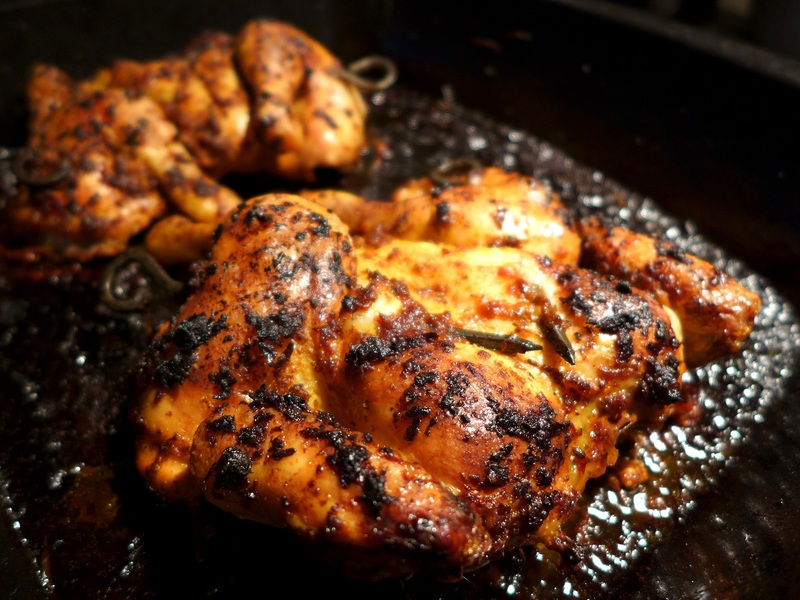 If the idea of the harissa marinade gets you hot under the collar, try lemon, honey and ginger. 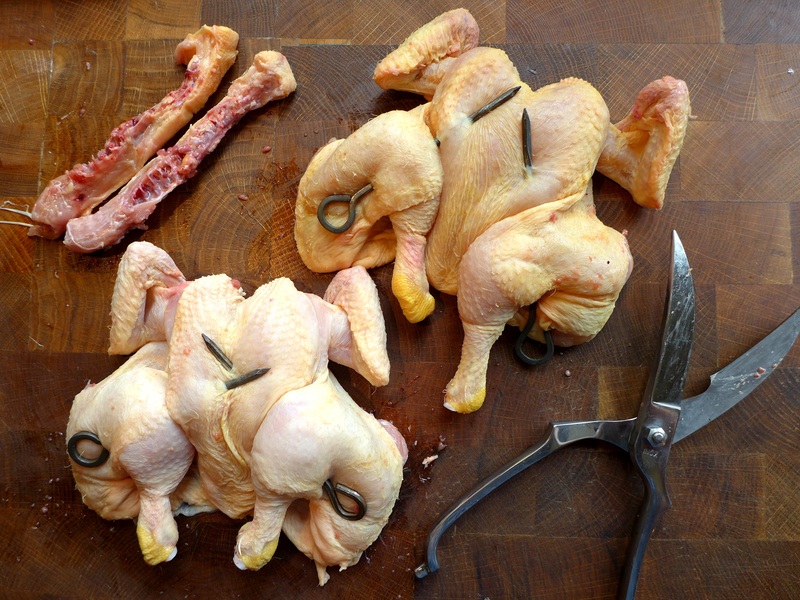 To spatchcock the poussins, lay them breast-side-down on your chopping board and using poultry shears or a sharp pair of kitchen scissors, snip out the backbone, starting on either side of the parson’s nose and cutting through the ribs. 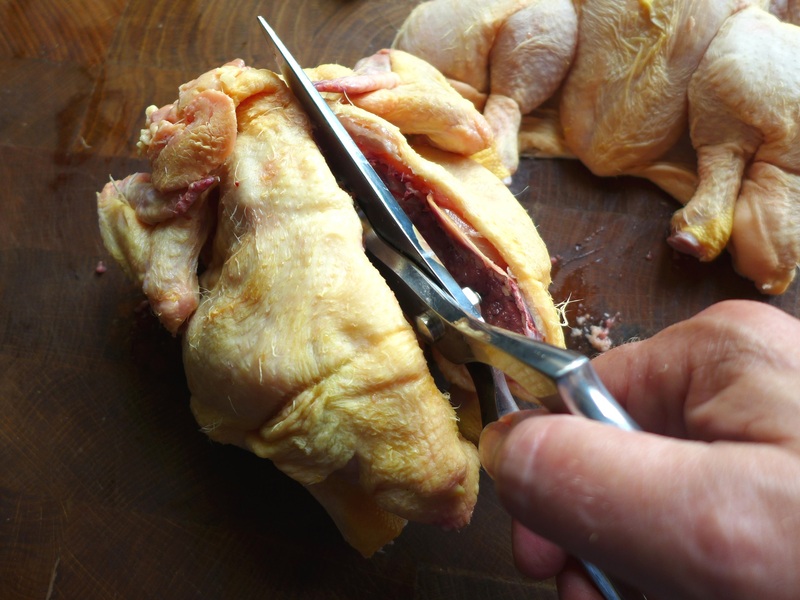 Turn them over and using the heel of your hand, press on the breastbone to flatten them out. Skewer the thighs to the breasts to keep them flat. Mix the harissa, oil and garlic and smear it all over the birds (easiest in a sealable freezer bag but watch out for the skewers) and put them in the fridge to marinate for anything between two hours to overnight, although you can cook them straight away if you’re pushed for time. Place in a roasting tin, season with salt and pepper and cook for 40-45 minutes in an oven pre-heated to 190C/375F/Gas Mark 5. Allow to rest for 5-10 minutes before serving. 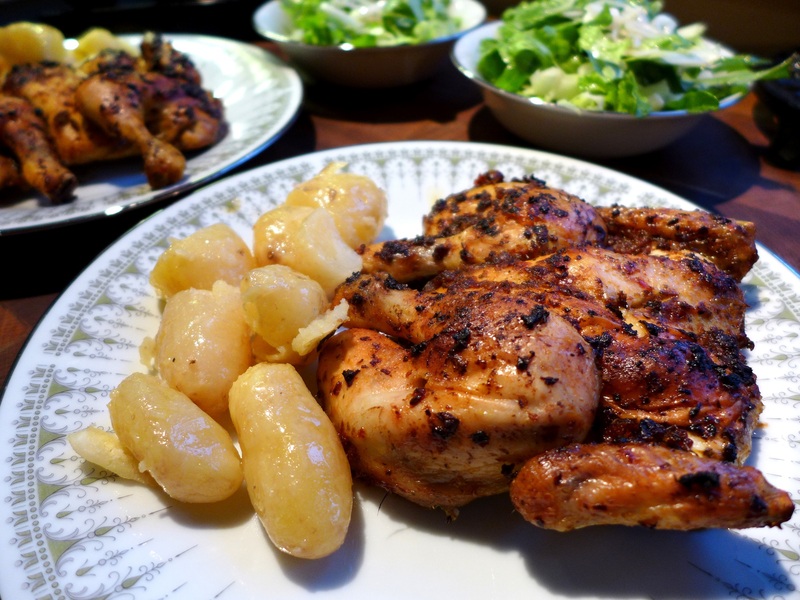 This entry was posted in Chicken and other poultry, Mains and tagged poussin recipes, quick suppers, spatchcocked poussins with harissa by Linda Duffin. Bookmark the permalink. What a wonderful idea to use harissa! I love spatchcocking. It sounds so British! You’ve had an odd year, weather-wise. Hope you get some warm days in the near future! I love finger-lickin’ food: ‘Im indoors doesn’t. But we both love harissa. He can eat this with a knife and fork then. Good luck with that.. This is one of those dishes I would never order when eating out but, if at home, let me at it! 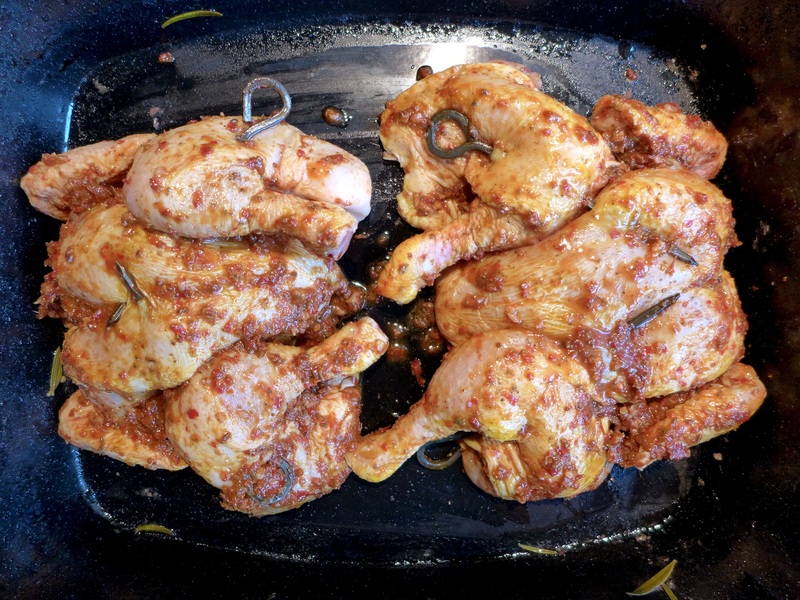 Harissa is such a great way to spice up a chicken and spatchcocking will cook it quickly, especially since you’re using poussin. Bet the birds ere nice and moist. I used to make my own harissa until I discovered a Middle Eastern grocery that makes it for a number of restaurants in town. This is soo much easier. Thanks, John. I do make my own harissa because I like it better than the jarred stuff you can get here, but lucky you! How great to have that grocery on your doorstep.